Developed by the NOVA Workforce Board in Sunnyvale, CA. Getting a job is only part of the battle. Economic sustainability requires a career focus and the ability to continually grow and adapt to new technological and economic challenges. Successful tech workers must have career navigation skills. In its April 2014 report, Bridge to Career Success, TechLadder (an initiative of the NOVA Workforce Board) identified five key factors for career success that extend beyond technical skill proficiency. 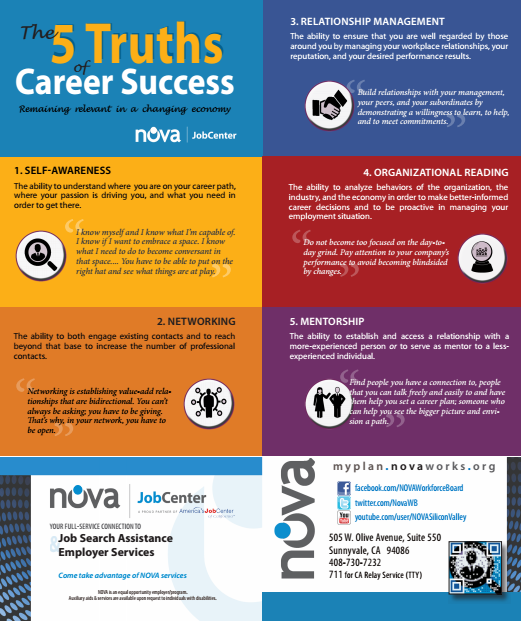 These “5 Truths of Career Success” (detailed below) are building blocks for developing personal leadership, entrepreneurism, confidence and self-efficacy, the traits that tech employers value. commissioned the Economic Advancement Research Institute to conduct this research as part of a strategic planning effort to expand its sector-driven portfolio into the IT/Tech industry. The Job Training Alliance (JTA) released their impact report on quality job training programs: “Job Training: Works, Pays and Saves.” This report, supported by SkillWorks, contains extremely compelling data proving the significant return on investment on quality job training programs for the participants served, taxpayers, and the economy as a whole. Funded in part by SkillWorks, Barry Bluestone and his team at the Dukakis Center for Urban and Regional Policy conducted research and released this report to assess the views of CVTE administrators, students, graduates, employers and parents, and the public at large and elevate the overall value of Vocational Technical Education in the Commonwealth of Massachusetts (January 2016). SkillWorks, the Workforce Solutions Group, and a broad group of stakeholders issued a set of workforce policy recommendations for the next governor of Massachusetts (July 2014). SkillWorks' funders completed a strategic plan in early 2013 to guide investments and priorities in Phase III of the initiative (2014-2018). A profile of Children's Hospital Boston's tuition advancement benefit, a systems change developed with the support of hospital administration, SkillWorks, and the Healthcare Training Institute (August 2011). In 2003, the Boston funder collaborative launched SkillWorks: Partners for a Productive Workforce, an ambitious, five-year initiative to improve the way the city's workforce development system serves low-income adults and employers. SkillWorks has since become a national model, inspiring other communities and states to launch similar initiatives. 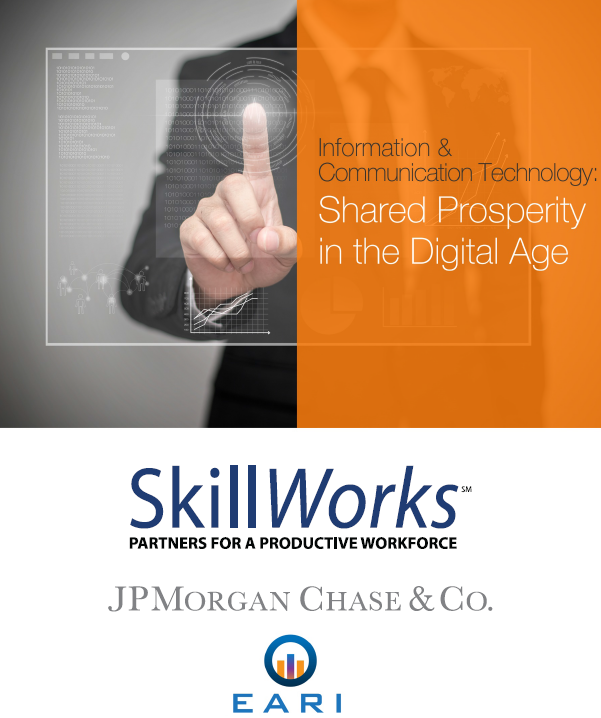 This report, by JFF's Geri Scott, looks at what SkillWorks has to tell us about the formation of partnerships, engaging employers, aligning resources around a common goal, and the challenges in advancing low-skilled adults toward family-sustaining incomes. Prepared by the Workforce Solutions Group for SkillWorks, this document tells the stories of Massachusetts residents using the current workforce development system. This paper, prepared for SkillWorks by the Workforce Solutions Group, shows that Massachusetts's very weak job-generating performance since 2000 calls for a major strengthening of economic development efforts, and that there is a clear need to improve ties between the state's economic development and workforce development systems. This 2006 paper, prepared for SkillWorks by the Workforce Solutions Group, analyzes employment and job vacancy developments in Massachusetts by occupational category in recent years both at the state level and in selected sub-state areas, and it assesses the implications of these findings for future workforce development planning and policymaking in the Commonwealth. This 2005 paper, prepared for SkillWorks by the Workforce Solutions Group, analyzes industry employment and job vacancy developments in Massachusetts in recent years, both at the state level and in selected sub-state areas, and it assesses the implications of these findings for workforce development planning and policymaking. To assist the Workforce Solutions Group in its research and public policy promotion work in support of SkillWorks, the Center for Labor Market Studies of Northeastern University has been engaged in a series of research activities on labor market developments in Massachusetts and their implications for the planning and design of future job training programs. The first research paper in this series describes the key data sources used in conducting the above analyses and explains the concepts and measures underlying the various employment and job vacancy estimates. Community health workers are essential to the U.S. public health system. They work in diverse settings and under myriad titles to improve access to health care for underserved populations using culturally appropriate methods. Despite their importance, community health workers are often not well rewarded, and their job tenure is unstable. Well-defined career paths are lacking, as are systematic skills sets and credentials recognized across work settings and usable for higher education. With funding from the Robert Wood Johnson Foundation, SkillWorks: Partners for a Productive Workforce asked JFF to recommend adaptations of the SkillWorks Workforce Partnership model in order to apply that approach to career advancement for community health workers. As the basis for these recommendations, JFF conducted research on the challenges to and national best practices for the advancement of community health workers. This paper, prepared for SkillWorks by the Workforce Solutions Group, examines earnings of Massachusetts adult workers. It seeks to address such issues as: how well year-round, full-time workers in Massachusetts fared in improving their real annual earnings during the 1990s, how changes in earnings varied across gender, educational attainment, race-ethnic, and nativity subgroups, how successful Massachusetts full-time, year-round workers in 1999 were in earning enough to support a family of four, and how rising inequality developments in Massachusetts compared to those in the other 49 states. SkillWorks: Partners for a Productive Workforce is addressing the needs of employers for more skilled workers and of workers for more and better access to jobs that pay a family-supporting wage. This five-year, public/private partnership is an ambitious effort on the part of philanthropy, government, community organizations, unions, and employers to change how workforce development is done in Boston. In Reinventing Workforce Development, Jerry Rubin and Geri Scott of JFF describe the start-up of this unprecedented initiative, focusing on its implications for workforce development throughout the nation. JFF helped design SkillWorks and now oversees its implementation as a consultant to the Funders Group, comprised of eight foundations, the City of Boston, and the Commonwealth of Massachusetts.